Hip-hop music and culture has reverberated far beyond its birthplace on the streets of New York. From the favelas of Brazil to the trenches of the Arab Spring rebellion, the music fuels and inspires countless millions around the globe. 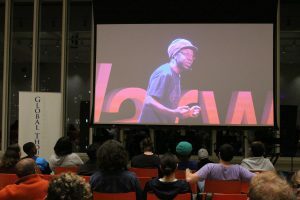 Harlem’s World Famous Apollo Theater and Columbia University’s Undergraduate Committee on Global Thought presented this compelling exploration of hip-hop music’s impact on global culture and social consciousness. 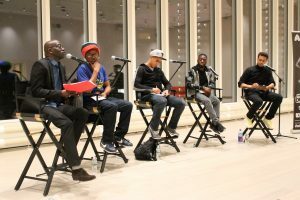 Dancers from the Apollo’s International Festival, Breakin Convention, joined Mamadou Diouf, Columbia Professor of African Studies, to reflect on the music’s impact on their lives and the politics of its local communities. 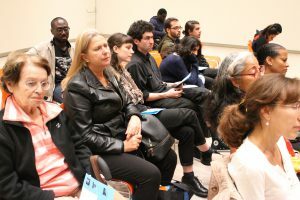 Registration is required for Fight the Power: A Global Conversation Exploring Hip-Hop and Social Consciousness. Please click on the registration button below. 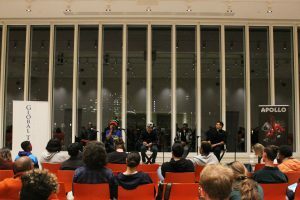 Fight the Power: A Global Conversation Exploring Hip-Hop and Social Consciousness will take place at Lenfest Center for the Arts. 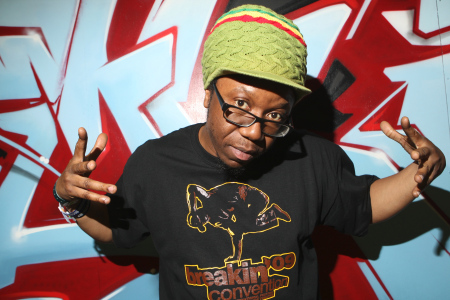 Jonzi D is the founder and Artistic Director of Breakin’ Convention. Since graduating from the London Contemporary Dance School, Jonzi has been committed to the development of hip hop theatre, performing and creating dance theater pieces around the world. 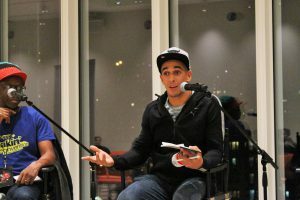 Since 2004 Jonzi D has been Artistic Director for Breakin’ Convention and has triumphed in raising the profile and giving a platform to hip hop disciplines, which has gained worldwide recognition as being at the vanguard of the development of the art form. He has toured his own work internationally and has been engaged by the British Council to work on several projects including East London, West Sydney which he directed for the Sydney Festival in 2010. In 2015 he featured on TEDx Warwick and spoke at European Commission forum on creativity and diversity. 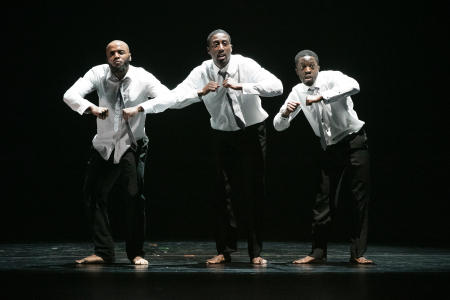 Lanre Malaolu’s crew, Protocol, has evolved from a competitive street dance group to an established dance theater company – but their core ethos has never changed. At the heart of Protocol is innovation and risk. The group is constantly experimenting with movement to create fresh and dynamic pieces of theater. The group uses a fusion of techniques, including street styles such as popping, tutting, and krump, along with physical theater, to create their own unique language of movement. Salah is a living legend in the world of hip hop dance. This consummate performer is a master popper, locker, b-boy, clown and all around entertainer. 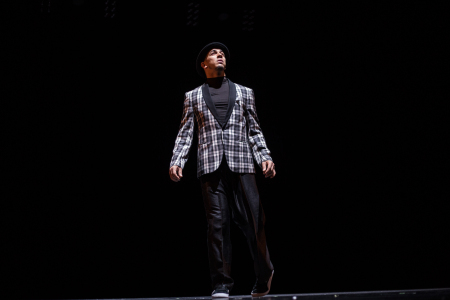 After his award winning performances all over the world, Salah returns to the Breakin' Convention stage after a seven year hiatus that has seen him work with Cirque Du Soleil, Puma, and David Blaine among others. Bee D founded the multidisciplinary hip hop dance group from Yeah Yellow in France in 2012 with fellow dancer Kami. Since their inception they have performed and battled internationally, representing France with numerous titles under their belt. To them their obsession with the color yellow represents the Sun, the Force, and the Light - a collective of dancing Jedi Knights showcasing their creativity, originality, and "joie de vivre", whatever style they dance, whether hip hop or breaking. 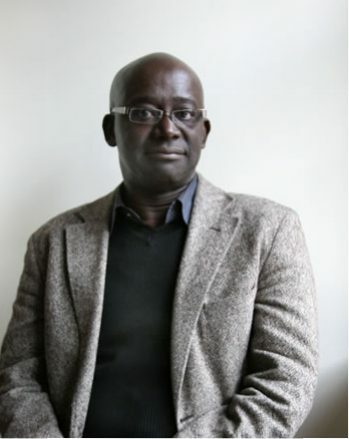 Mamadou Diouf (Moderator) is the Leitner Family Professor of African Studies and the Middle Eastern, South Asian, and African Studies (MESAAS) Department Chair. He joined Columbia University in 2007. He holds a PhD from the University of Paris-Sorbonne. 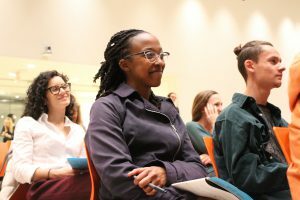 Before joining the faculty at Columbia University, he was the Charles D. Moody Jr. Collegiate Professor of History and African American Studies at the University of Michigan, from 2000 to 2007. Before that, he was Head of the Research, Information, and Documentation Department of the Council for the Development of Social Science Research in Africa (CODESRIA) and faculty member of the History Department of Cheikh Anta Diop University in Dakar, Senegal. Breakin Convention returns to the Apollo with another packed program featuring the best and brightest hip-hop dance companies from around the corner and around the world. The Apollo celebrates the global impact of its hip hop roots with everything from mainstream to experimental dance, showcasing all the hallmarks of the genre: explosive energy, intricate step sequences, synchronicity, and choreography. International performers include the legendary Salah and Yeah Yellow of France, South Africa’s Soweto Skeleton Movers, and the UK’s Protocol. From New York, it’s the legendary Dynamic Rockers, Rep Your Style, Harlem’s own Bwreckfast Club from Litefeet Nation, Passion Fruit Dance Company, Havoc & Klassic. Spilling off stage and taking over the whole building, workshops, graffiti, DJs, and dance battles make Breakin’ Convention an unforgettable experience for the whole family.